The Massachusetts jewelry retail store responsible for a controversial billboard last year that read, “Make her speechless for a change,” is now catching heat for a new billboard that references NFL players taking a knee in protest of police brutality aimed at black Americans. 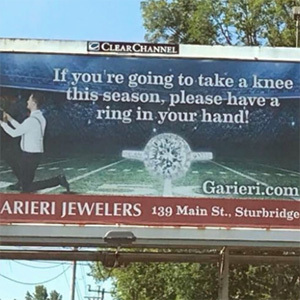 The new billboard from Garieri Jewelers reads, “If you’re going to take a knee this season, please have a ring in your hand!” and shows a young couple in the midst of a proposal, with a football field in the background. The billboard, captured by drivers who have pulled over to photograph it, has gone semi-viral on social media and has garnered both support and vitriol online. 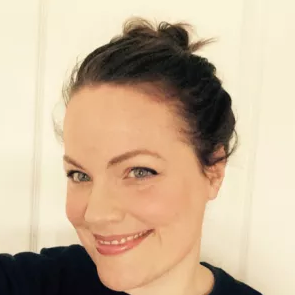 Scott Garieri, owner of Garieri Jewelers in Sturbridge, Mass., says he and his daughter, store manager Alexandria Garieri, intentionally create billboards that spark a dialogue—and shy away from “pure vanilla” ads that are easily ignored. Scott also doesn’t back the Black Lives Matter movement—perhaps unaware of the stark statistics that prove police shootings of black individuals greatly outnumber those of white suspects. Scott says the initial feedback to the billboard was largely positive and that sales have followed (“Let’s just say our billboard costs are paid for for the year,” he notes). But the retailer has no plans to take it down. Scott won’t switch it out until December, when he plans to put up a New Year’s themed message.